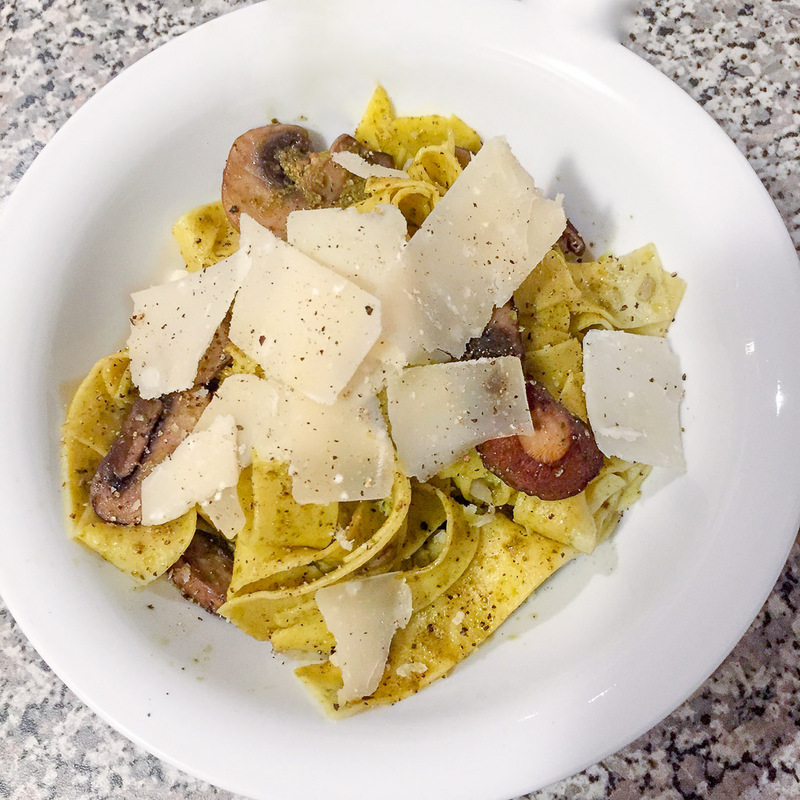 This Mushroom Pesto Pappardelle is a perfect quick and easy vegetarian meal to make whenever you’re short on time, but just can’t bring yourself to sacrifice on flavour. Minimal components, minimal fuss, maximum flavour. Oh, and did I mention you can have it ready in as little as 20 minutes? Yeah. It’s pretty much perfect. This post is all about hakuna matata. 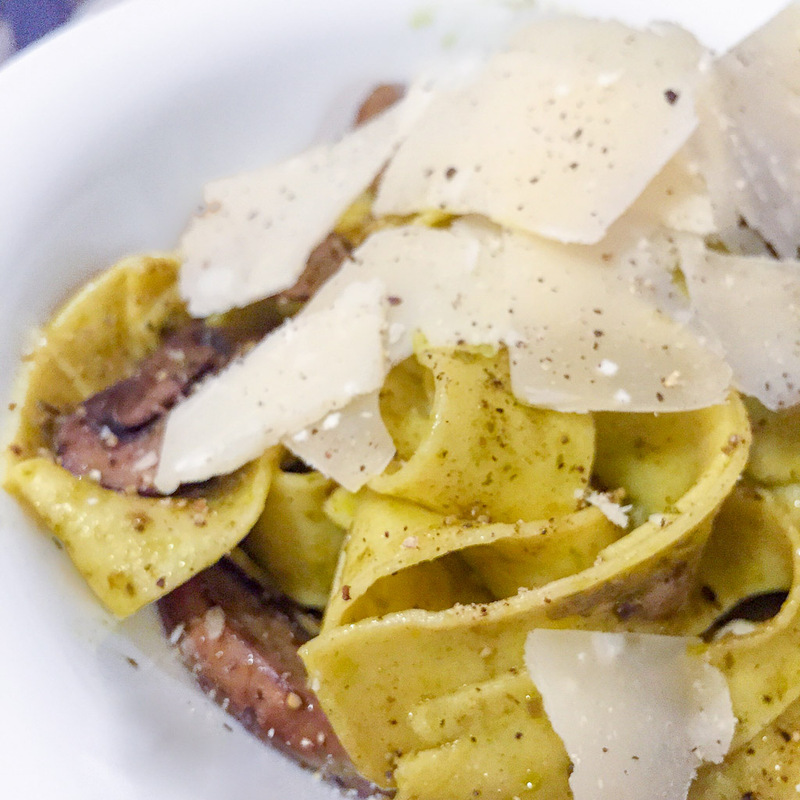 It’s also about making a delicious Mushroom Pesto Pappardelle (or whatever pasta you want to use) in a very short period of time. But it’s mainly about the hakuna matata. For those of you not in the know, hakuna matata is a Swahili phrase that means ‘No worries’. It was the YOLO of my generation. Sort of. And it really applies to this recipe. You see, this is a story. All about how, my life got flipped turned upside down. And I’d like to take a minute, just sit right there… I’ll tell you how I became the prince of a town called…wait…sorry, wrong childhood memory. You see, I was at a friend’s place just chilling, playing a little Xbox when his wife called saying that her boss would be unexpectedly be joining us for dinner, and that we needed to cook some proper food. Looking in the fridge, there were very few ingredients available, and there definitely wasn’t enough time for us to make a shopping run. 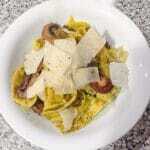 We had to use whatever they had at home, and this is (a slightly modified) version of what we served that day. We almost didn’t serve it out of the fear of her boss’ hate for mushrooms. But in a moment of inspired rebelliousness, we said hakuna matata (or a slightly more explicit version thereof), and created a dish with mushrooms as the star. And you know what? The boss loved it. They’ve cooked it twice for him since! (But in case you really do hate mushrooms, this Lemon Fettuccine with Garlic Shrimps recipe works wonders in dinner situations too). It just goes to show – you can be short on time, short on materials, just never let yourself be short on inspiration. Live the hakuna matata lifestyle and go with your gut, because sometimes you just need to throw caution to the wind! Can you believe it’s already nearly the end of February 2017? Holy moly. February. Two-thousand-and-seventeen! Time kinda flew by. Here’s hoping you’ve had an amazing start to the year, bestie! And to help make my year amazing, please do tell me something lovely in the comments (anything you want, even great news you want to share about yourself), and share this post with all your friends! Remember, you can always follow me on Facebook, Instagram, or Twitter to keep updated on my latest posts! 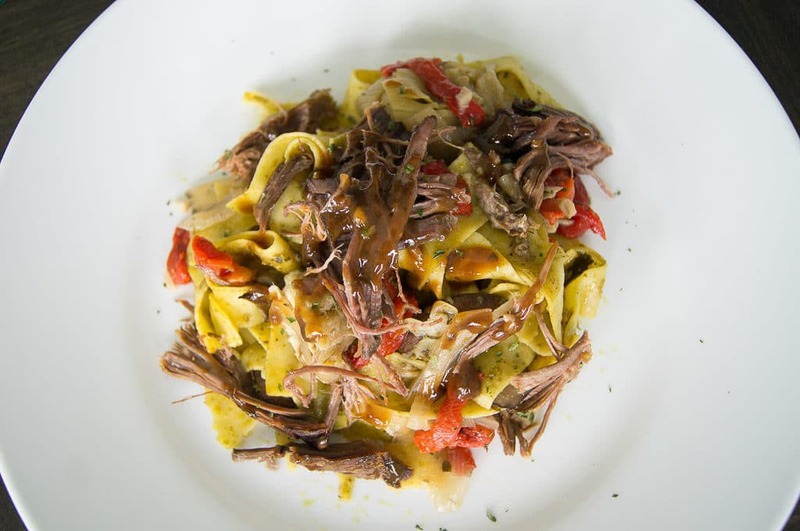 And if you’re feeling really snazzy, pair this Mushroom Pesto Pasta with some pot roast. Heat about 1 tbsp of olive oil in a separate frying pan, add garlic. Stir constantly for 3-4 minutes until the garlic starts to colour. Add mushrooms and stir to mix with the garlic and oil in the pan. Season with a little salt, and put a lid on top to help the mushrooms maintain moisture. Stir occasionally until cooked through. Your swans are so cute that I would not like to eat them!! 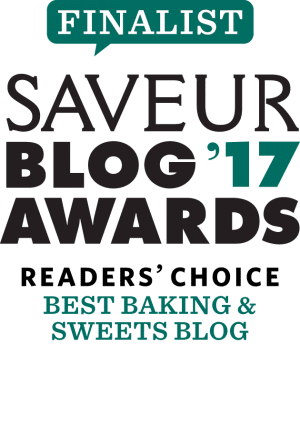 I’m glad you like the Cream Puff Swan recipe! Who are these other friends you have besides me that you are cooking for?! This sounds so yummy! I have a nut allergy and they’re usually in perso sauces – what’s another sauce that would go well with this? Omg this looks so good! I’ve just started liking mushrooms so this is perfect for me! Thanks Jessica! Please give it a try and let me know what you think! This looks awesome, I was thinking the whole time it would be great with sausage. Or as you mentioned, pot roast. Thanks for the recipe. Thanks Kevin! Sausage is another great option 🙂 Hope you enjoy the recipe! Mushrooms are so hit and miss, they can be so horrible if left to go all slimy but I love them when they’re done right and this looks delicious! Thanks Charlie! Slimy mushrooms sound horrible, glad I’ve not had a chance to experience them! This looks on point! I love mushrooms and often just cook a bunch so I can add them into any dish. What kind of mushooms do you tent to cook with? Ahhh, this is so freakin fabulous that I laughed so much, thankyou Riz. I was thinking…. “NOooo, don’t cook the boss mushrooms”, but there you go, you did it and he liked it. hakuna matata = a truly magnificent way to live life… love it. Wishing a hakuna matata-kinda day to you! Thanks for commenting!